Figgy cheese – or would that be cheesy figs? Simplicity combined with fresh ingredients is the essence of great summer food. There need not be a lot of fuss when produce is at it’s peak in flavor. Keep it simple so that nature’s flavors shine through. I made these figs as an appetizer the other night with a minimum of ingredients in 10 minutes. You can too. Drizzle a little honey over the figs after they roast, if desired. These figs were so sweet and sublime I chose not to add anymore sugar. These figs are also delicious on crostini. Heat the oven broiler. 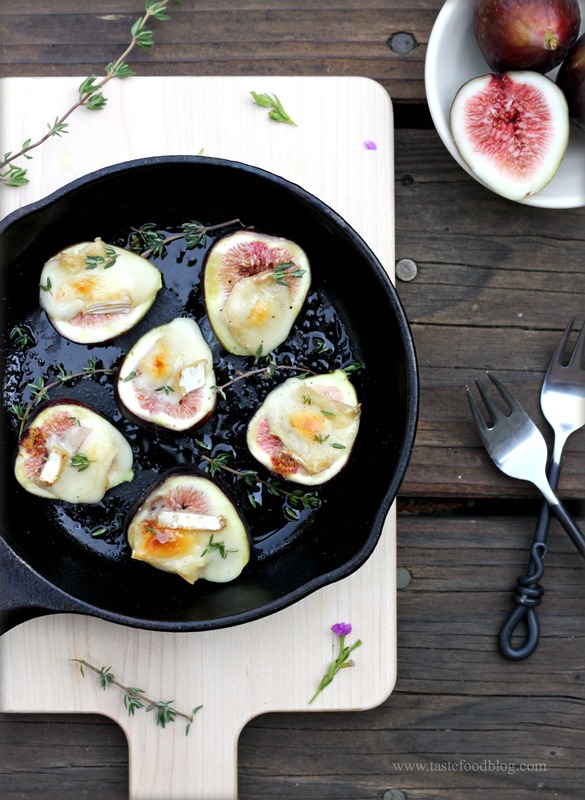 Place the figs in a cast iron pan or baking dish cut-side up. Slice the cheese and cut in squares no larger than the width of the figs. Lay the slices in the center of the figs. Broil until the cheese is melted and lightly golden. Remove from the oven and drizzle with a little olive oil. Lightly season with a few pinches of salt and a grinding or two of black pepper. Garnish with fresh thyme. Serve immediately. Figs and runny cheese, my favorite – beautiful figs in season now, yes? The simplest of recipes but outstanding with ripe figs. I’m hosting guests at our home next week and this recipe is just what I need, seasonal and simple! And loaded with flavor! A perfect combination! Refined and scrumptious. All recipes with figs are really great and yummy! Yours look very attractive! I’m going with cheesy-figs, and a great big YUM!